Should I use Book Repair Glue? So you think you need some book repair glue? But maybe it is actually some paste that you need. These are the two most common adhesives I use in my book restoration and repair work. My book repair paste of choice is a rice paste and the book repair glue of choice is a poly-vinyl-acetate or PVA. PVA is a white glue that comes in many forms. The important thing to know when choosing a white glue is that you don’t want it to have fillers that will turn yellow and make it crack later. (Think of the old Elmers glue you used in grade school.) The key is to buy a truly archival glue and even then there are variations. 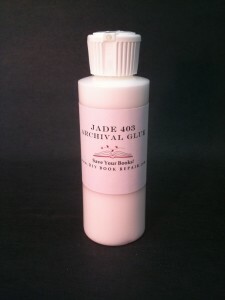 I use Jade 403 (a brand of PVA) because it has very little smell and has just been overall the most pleasant to use of all the PVAs I have tried. One thing to know about PVA is that it goes bad if it freezes so shipping can cost more during cold months. Most scrapbooking or craft supply stores will have some archival PVAs for you to choose from. When a PVA is called archival, it should be because the ph is neutral and because the glue is stable and stays flexible for a very long period of time. not all glues that claim to be archival actually have these qualities. There is no regulation of the word “archival” and it doesn’t even have a standard definition. I have heard negative reviews of some PVAs and pastes too that claim to be arvhival. PVA is not reversible. There is a reversible PVA that you can buy called Jade 403-R but the well respected conservator, Don Etherington, told me that it just takes away the best qualities of PVA and makes it less useful. Obviously this is a matter of some opinion since many conservators do use it. The paste I use is Nori rice paste (a brand of paste), because it is simply the best product I have worked with. It is archival in that it has a neutral ph, the adhesion lasts a long time and it is easily reversible in water. Also it smells good. Sort of like vanilla. I used to cook up batches of Zen Shofu wheat paste every few days to keep up with what I needed in the shop. What a pain. Cooking, straining, cleaning up… yuck. I then tried instant pastes and found their adhesion was not very good. 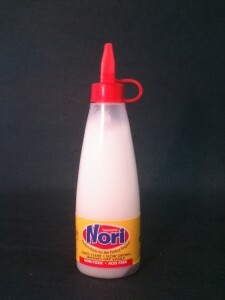 So, I am sticking with Nori. Ha ha. So when do I use each of these? and why? Inner hinge areas: Because the flexibility and strength of PVA means I can use less. Even as little as only 1/16th of an inch to attach something. Solidifying bumped corners: Because it is fast and less wet which is good if the corners are leather. Sealing edges of boards: PVA is actually a plastic so it really does seal it. It keeps things from breaking up further. Leather books: While paste is used to put leather onto books in the first place, if it is old leather or powdery or broken up then the moisture from paste would turn the leather black. Therefore PVA is better for reattaching broken leather. Read my blog: Sophia’s Book Repair Hierarchy and Book Cleaning Hierarchy to know more about the proper sequence of events for using adhesives. Page repairs: Because PVA shows up as a dark line on the edges of any repair whereas paste disappears better. Also paste is easily reversible so if I put it on the page wrong I can just do it over. Solidifying bumped corners: Because it soaks through the fibers and makes it easier to get the whole area and causes less color change on cloth in general. Re-attaching loose areas on a book-cloth spine or cover: Because glueing with PVA is more permanent and if I ever need to undo this for a better restoration I won’t lose original pieces. After coloring in a faded spot on a cloth covered book I would use paste to seal it as a sort of starch. It is less shiny than the PVA. There are other things I use each of these for but these are the main ones. Keep an eye out for a video on this soon.